Melody Vallieu | Miami Valley Today Board member Ruth Jenkins, left, and director Barb Holman go over the plans for the interior of the new Family Abuse of Miami County. TROY — Fundraising for the relocation of the Family Abuse Shelter of Miami County has reached its final stages. According to shelter director Barb Holman, the project is about halfway to its $2.3 million goal to relocate to a new property, a former doctor’s office, at 530 Crescent Drive, Troy. Holman said the figure encompasses the price of the land, renovating and adding on to the existing building, architectural fees and furnishings. The board is raising funds, at approximately $1.3 million to date, beginning with local foundations, according to board member Ruth Jenkins. Funding for the project has been been secured from the Troy Foundation, Miami County Foundation, The Acorn Society and an UVMC Community Benefit Grant, Jenkins said. The second phase included mid-level corporations and private individual donors. The board also has pending grants that would increase the funds raised to three-quarters of the goal. The final drive of the phase is a mailer going out to the community this week asking individuals to donate what they can, Jenkins said. The mailer can be returned with donations of any amount or visit FamilyAbuseShelterofMiamiCounty.org. Holman said they also are available to speak to the public about the shelter’s mission and the importance of the relocation. The two agree that waiting until a considerable amount of funding was raised before reaching out to the general public was the right thing to do for people to understand they are actively working on securing the funding, Jenkins said. “We’re now going out into the community. We think it’s the right time. We wanted to wait and make this a community project,” Holman said. The relocation of the abuse shelter — a private, non-profit organization — to the 2-acre space is focused on the additional room needed for residents and services, the children who call the shelter home and the ability to be handicapped-accessible, Holman said. The new shelter building, which will be 7,370 square feet, will be located on one floor and increase shelter space for women and children from 26 to 40 beds. Bathroom facilities will go from one upstairs bathroom to six dorm-like showers and stalls. Separate space for victims of domestic violence and the homeless also have been designed into the two wings, Holman said. An increase in the need for housing for the older population also has been seen in the last few years, Holman said. The shelter also needs to be handicapped-accessible, which the housing and bathrooms on the second floor at the current facility do not facilitate. One of the highlights of the new location, according to Holman, is the multiple outdoor areas for children to be able to play outside. There is currently no outdoor space for children at the Franklin Street residence. “I’ve been thinking about in the summertime and how we’re going to get to let the kids go outside and play, that is so exciting,” Holman said. In the administrative office area, which will include the renovation of the current office space at the site, Holman said staff will be able to offer direct services and increase confidentiality when working with agencies such as New Creations Counseling and the Miami County Recovery Council, which will have a satellite office in the building for on-site services. Jenkins also said the new facility will be more energy-efficient, offer more parking and will help the shelter comply with the guidelines of its funding sources for operating costs. While renovation and construction take place at the Crescent Drive location, the shelter will continue ownership and operation of The Franklin House and The Barbel Adkins Education and Activity Center, at 16 and 22 E. Franklin St., respectively, Holman said. She said staff and the board will make a decision on the Franklin Street properties when the time comes to move to the new location and “do what is best for our agency.” The organization also operates the Buckeye House, a homeless shelter for men. The staff and board hope to have the new shelter location ready for a grand opening in the spring of 2020, Holman said. 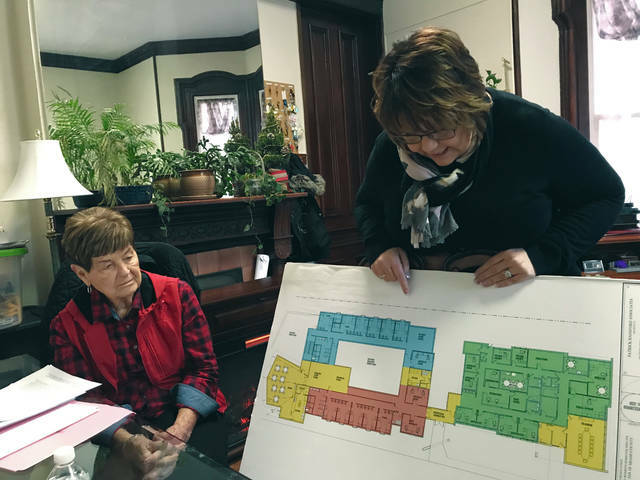 https://www.tdn-net.com/wp-content/uploads/sites/21/2019/02/web1_Abuseshelter.jpgMelody Vallieu | Miami Valley Today Board member Ruth Jenkins, left, and director Barb Holman go over the plans for the interior of the new Family Abuse of Miami County.